For the owners and managers of large residential properties like apartment complexes, ensuring resident safety is a top priority. However, boosting curb appeal and controlling costs are also important, so any major improvements should enhance the property’s appearance while offering a strong return on investment and minimal need for maintenance. The right perimeter fencing—such as fencing composed of wrought iron and composite wood—can satisfy all of these considerations, adding to a property’s safety and beauty while delivering value for years to come. DCS Industries recently worked with Coronado Apartments, a bustling complex in Tempe. The property had been enclosed by old wood fencing, and the owners wanted to upgrade the look. 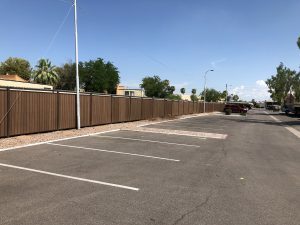 After the existing fencing was removed and our team had assessed the property’s needs and style, we designed, manufactured, and installed 2100 linear feet of composite wood and wrought iron fencing. The new composite wood has a rich hue and is enclosed by a high-quality wrought iron frame, giving the property a more upscale aesthetic. In addition, the gaps between the pickets of the fence are barely noticeable, which creates a seamless appearance and provides greater privacy for the apartment residents. 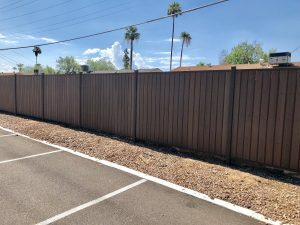 As with all products from DCS Industries, the new fence at Coronado Apartments is designed to stay in excellent condition for many years. We use composite wood that maintains its stylish appearance without needing to be stained or refinished. Additionally, our wrought iron is made from premium-grade steel, ensuring that it will remain durable even when exposed to intense sunlight, blowing dust, and other natural elements that outdoor fixtures are exposed to in the desert. Customers may opt to have any of our wrought iron products galvanized, which means that we apply a zinc coating to protect against rust; galvanized products from DCS Industries carry a ten-year warranty. 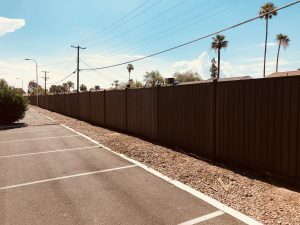 With over a decade of experience in the Phoenix area, DCS Industries has created fences and gates for a wide variety of properties, including homes, apartment complexes, office buildings, hotels, and more. We work closely with each of our customers and take into account their needs, goals, budget, and style preferences, and upon installation, our skilled technicians ensure that the finished product exceeds expectations. Is it time to upgrade your residential or commercial property’s style with new fencing? Contact DCS Industries today at 623-825-7700 or online at https://dcs-ind.com/free-estimates/ for a free estimate!